Jesse (Jon-Michael Reese) is a playwright working on his master's degree, and Neil (Kevin Fanshaw) is from a wealthy family and devotes his time to social justice. The play gradually reveals the course of their relationship through nonsequential scenes that take place over several years. Time and place are indicated by Kathy Maxwell's projections, which become more evocative as the show progresses, covering scenic designer Maruti Evans' beautifully simple set with realistic and symbolic images. All of these design elements combine with Kevin Springer's sound, Abbee Warmboe's props, and Sarah Bahr's costumes, to create a beautiful environment for this story. 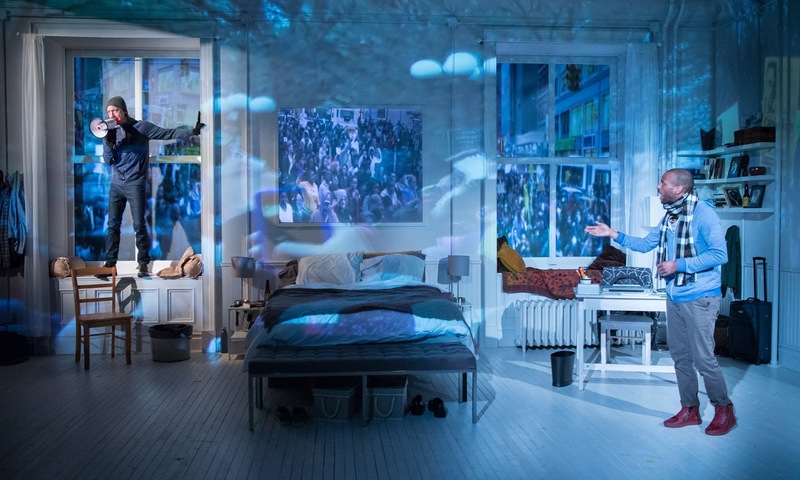 Rivers' script presents characters who speak thoughtfully and disagree articulately, whether about the value of public protests or about issues facing their relationship. Fanshaw plays the more openly demonstrative Neil with a great deal of sweetness and earnestness. Playwright Jesse is more self-contained, and Reese deftly indicates the simmering resentment behind Jesse's flippant manner. The two actors, with director Talvin Wilks, create an achingly real relationship with highs and lows that brought me to tears. I recently saw the Guthrie's production of Guess Who's Coming to Dinner, and although I did not write about it, I agree with the review over at Cherry and Spoon that the remounting of a story from 1967 lets the audience view the interracial issues from a comfortable distance. I wish everyone who has seen that production would also see This Bitter Earth, and experience some of the same issues in a much more immediate, nuanced, and challenging way. If you haven't seen the Guthrie show, see this one instead! On all levels, from relevance to creativity and impact, This Bitter Earth is the play we need now.